Scientists in the US have devised an algorithmic process to speed up the design of microfluidic chips, generating a library containing thousands of different chip designs that researchers can search by functionality. With a new online database created by Grover and his team, even researchers with no microfluidics experience can find the perfect chip to suit their needs. 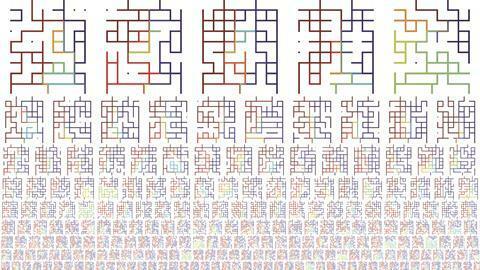 Grover’s team created a computer program that generates thousands of random microfluidic chip designs and simulates their behaviour. The database collects these simulated designs, and users can query it to find chips suitable for given tasks. Grover’s group demonstrated the concept by letting the software design chips that would take two fluids as inputs and generate three output fluids with specified concentrations. 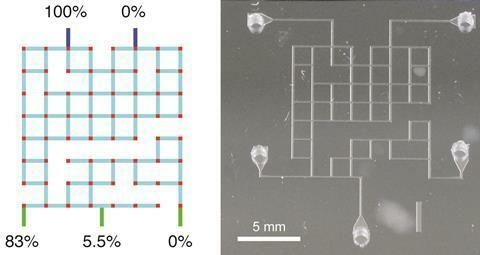 They fabricated and tested 16 of the suggested designs and found that they worked as well as other microfluidic mixers. ‘With this research, users can be sure to pick the best design possible: a huge step towards the introduction of “best practice” layouts and standardisation in microfluidic chip design,’ says Bastian Rapp from the Karlsruhe Institute of Technology, Germany, whose researches microfluidics.